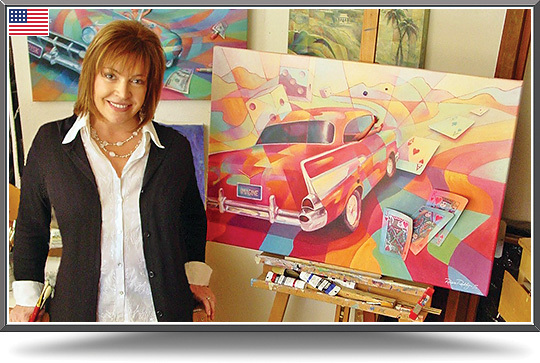 Robbie Reddy features classic American cars in this series of 3-D paintings, She takes a close and humorous look at life, the sometimes-stifling expectations imposed on individuals in contemporary society, and the soul’s unquenchable desire for freedom. Robbie has both an uncommon point-of-view and techniques that challenge categorization. The art occupies a niche of its own. Her painting style has been described as 'prismatic' both in its division of space and chromatic range. Her color palette is uncommon, and uncommonly striking. The work has a refreshing honesty that disarms the viewer, and allows the message to penetrate. The art makes people laugh. It makes people think. In it, they recognize themselves. "I have an eye for 50s style and have to admit that I’m easily seduced by cars. I let my imagination take a wild Southwest ride in this series of paintings. The art is very much about breaking free – from tradition and expectations -- and daring to take big risks. "I have a relationship with cars that I can’t entirely explain. More often than not, they’re the focal element in my dreams. For years I wondered what that was all about. One day it dawned on me that, quite simply, they represent freedom -- in all its forms. "In the paintings I like to use the classic icons of Las Vegas such as dice and cards. Along with the cars they provide symbolism and a metaphor for recurring themes of freedom, chance, luck, big dreams and destiny. "I always invite the viewers to think, to find their own truth. The art is just the catalyst."